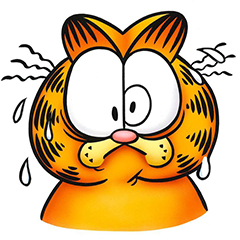 I'm a childhood fan of Garfield, and I call this 'Garfield Sans Thought'. By leaving Garfield in but removing his thought bubbles, he can be seen as more of an actual cat doing cat things. Plus I think it can be way funnier. I asked myself a question once, “What if I just removed Garfield’s Thought bubbles?” It turns out the results can be hilarious, weird, and a host of other things. I tend do to do these on a whim, but I have a few from the past I need to get online first. I hope you enjoy. Original Published 02005, August 26th. Image downloaded and altered without permission. Not intended for sale.